Complicated situation continues. Yesterday there were storms and convection around southeast Arizona. NWS Tucson radar finally back in operation between 6 and 7 pm last evening. Thunderstorms/showers with strong winds at Douglas, Ft, Huachuca, and Nogales yesterday afternoon. Measurable rain at 5 RAWS stations in southeast Arizona, but max amount only 0.15" at Rucker. This morning the downslope flow continues, but moisture has gradually inched upward with values around 1 inch across the lower elevations. The TWC morning sounding data only a bit dry but with CAPE indicated very similar to yesterday morning. The NAM forecast runs this morning (12 UTC 30 Jun 2010) show the Pacific trough and the remnants of Hurricane Alex doing battle with southern Arizona sitting right in the middle of the two features. Right now the NAM seems to indicate the trough dominating. The images above show: the morning sounding at Guaymas (top) to be quite dry with less than an inch PW; the sounding at Mazatlan (middle) which is quite moist with PW well over 2 inches; the current NAM 700 mb forecast for 12 UTC Friday, July 2nd. I think that the remains of Alex moving into the lower GoC will have a good chance of triggering a moisture surge up the GoC. The cloudy and damp push at 700 mb, perhaps with areas of thunderstorms moving off the Sierra Madres, will bring dramatic cooling over the lower GoC. Such cooling at 700 mb, particularly with storms, often triggers a surge. So, what happens over the south half of GoC may well hold the key to local weather for the rest of the long weekend. John Diebolt reports: Another, windy and warm night west of the Tucson Mountains with moderate-strong easterly flow keping temperatures way up (89F at 5AM) TD up to 55 degrees by 5AM. With sunrise only a few meager clouds to the distant east..without vertical development. Have noted the airport has had rather stiff SE breeze betwen 10-15 MPH since 153AM but nothing like 24 hours ago. TD is nearly identical but temp is a few degrees warmer there. At the moment (5AM), RUC (from NWS TWC Monsoon tracker page) at 700MB showed TUS area in a bit of a Col with weak NW flow at 500 MB and 300MB with TUS at the northern end of the sharp 300MB trough from the TUS area southwest across central Baja. Sharp 300 MB northerly flow is shown advancing into western Arizona. Seems to agree well with very dry air seen on WV images in that area. Will be interesting to see what the 12Z TWC sounding shows us especially with the weak inversion above 500 MB..barring any bad data. Certainly not the ideal setup for a big day. Another round of mountain-huggers and gusty/dusty/hot in the valleys? (assuming the 500 MB subsidence inversion and dry air aloft does not supress things even more). Will be interesting to see what unfolds! First - yesterday afternoon brought moderate buildups, some virga, some mammatus, some wind and a couple of spits of rain here at house. First Trace observed here since the Trace on May 2nd. Tucson WSR-88D radar remains broken and out of service, so more days with storms in southeast Arizona but no radar documentation of what actually happened. This morning brought clear skies, very warm temperatures and brisk easterly winds at sunrise (see Diebolt comment in post below). Dewpoints have climbed slowly; the backdoor front came in stronger than I expected; so we have downslope flow affecting the increased low-level moisture that's come from the east to southeast (definitely not from GoC as per Douglas comment below). Tucson sounding this morning is somewhat chopped up - warming temperatures at 500 mb compared to yesterday; some increase in low-level moisture (note that sounding remains dry by 3.5 mm vs GPS); and strange west winds at 500 mb. If boundary layer can mix out at 5 g/kg this afternoon there is CAPE somewhat similar to yesterday, perhaps even enough for deeper storms when ice heat of freezing is added. The entire upper-troposphere has westerly flow, and the charts above 400 mb show a pronounced trough entrenched over the west and northwestern Mexico. The 500 mb morning analysis (middle graphic) indicates the anticyclone has shifted north to Wyoming and that there's a smaller scale, cyclonic feature of some kind over Arizona. Basically, winds are L/V and height gradients almost zilch from the Four Corners southward to central Mexico. 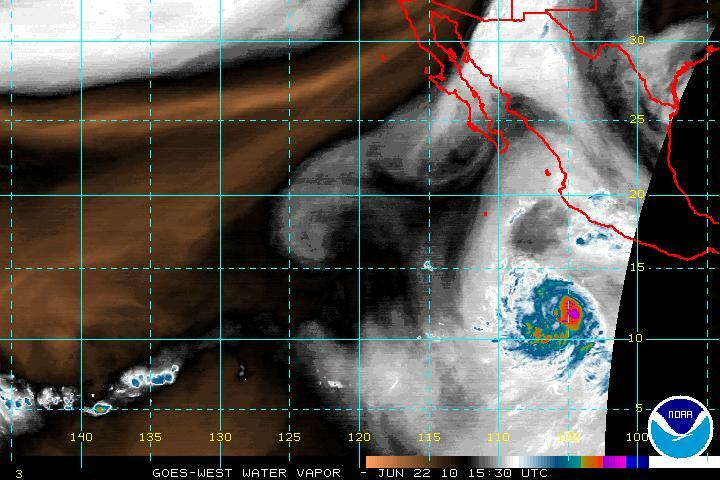 A pocket of cooler air at 500 mb does remain over Arizona and northwest Mexico, favoring convective development. Although moisture is higher over toward El Paso, the 700 mb flow in the NAM model forecast (bottom panel valid at 06 UTC tonight) just can't seem to get the higher RH west of the Continental Divide, except down in Mexico. What does all this add up to? Assuming the downsloping doesn't continue strong and suppressive all day, then storms should be somewhat similar to yesterday. Mostly on mountains and strongest east to north of Tucson, but with some potential for stronger downburst winds in western portions of the lower deserts. Note - it seems to me that the U of A Atmo runs of the high-res WRF model have done better with downslope events than the NAM. I note that the NAM doesn't forecast much today in the lower elevations, and I don't know what the WRF might be doing. Art Douglas wrote yesterday afternoon - OK guys.............dew points in Guaymas and Hermosillo are both in the low 40s!!!!! So this isn't Pacific moisture. Here in Ash Canyon our winds turned to SE late morning and it gradually got cloudy with buildups all directions and lots of virga and a few periods of big drops of rain "T". Clouds are rolling in from the SE. Dew point is up to 44F after being at 30F. 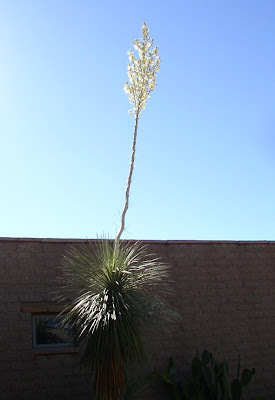 John Diebolt comments this morning: Classic Gusty/Dusty day on Monday with strong easterly winds persistant through the night keeping temperatures in the low 80s at the airport and mid 80s here at the house west of the Tucson Mountains overnight (85F at 5 AM). TD trends were slowly up through the night. NWS AFD this morning cites dry bias in 00Z TUS sounding as possibly contributing to the sharp reduction in the convective activity in the 00Z NAM for today. Some Southern Region NWS offices are doing 6-hourly balloon launches in support of NHC. So lets hope they dont all have a dry bias like TUS! 00Z NAM also had steady easterly mdt sfc wind flow. I am wondering if downsloping off the higher terrain under a sustained easterly wind regime today might actually work against convection and if the NAM has the resolution built in to pick this up? I seem to remember some active convective day busts due to a sustained easterly sfc wind and downsloping in the past. That might have been deeper into the season, though. Very quick look at the 6Z NAM showed a little more QPF for SE AZ than 0Z. Any thoughts? Will comment in next post. 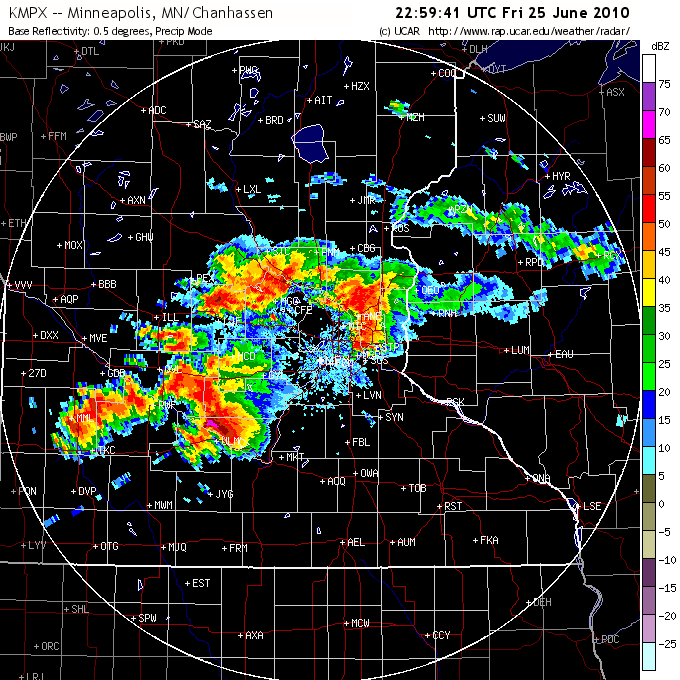 Mike's rough flight Minneapolis was on Friday afternoon and I had posted wrong radar images - I've corrected in earlier post and show image at approximately 00 UTC on the 26th of June. 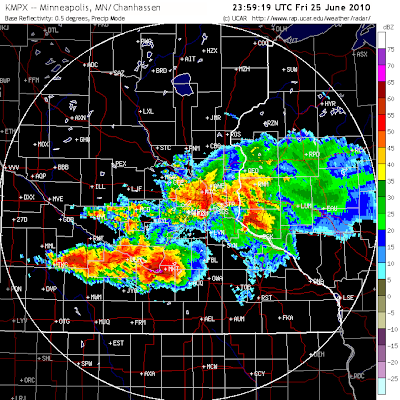 The radar shows four or five large supercells surrounding the Minneapolis airport. I just can't imagine that a pilot would be trying to make a landing in the midst of such severe thunderstorms! 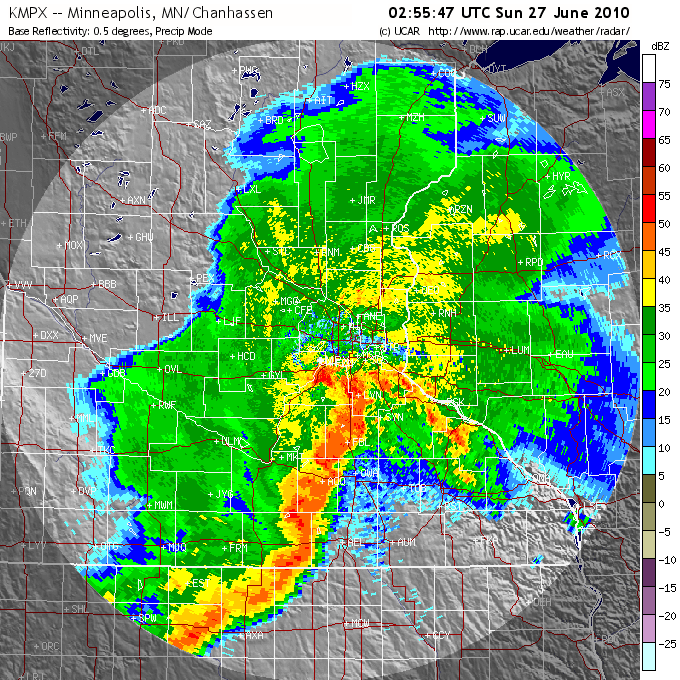 If the pilot were trying to make his decisions based on an aircraft 5-cm wavelength radar, then there could have been serious interpretation problems, since storms like these badly attenuate a 5-cm radar. There are a number of documented incidents that involved bad interpretation of on-board radar data. However, I would have thought that AIRINC would now provide live WSR-88D data to aircraft cockpits. Thus, this situation is a bit strange - regardless, it is the pilot who has final say re what's he/shes' going to try to do in such a situation, assuming the airport had not been closed for operations. Above is current NHC forecast for TS/Hurricane Alex, indicating that it would come ashore in Mexico south of Brownsville on Wednesday evening. The GFS and ECMWF are now essentially in agreement on a somewhat similar forecast track (at times during the last few days the two models have had wildly divergent forecasts). Both models indicate the remnant disturbance will move slowly west across central Mexico. However, both models also forecast another episode of strong troughing at 500 mb into the western US. This unusually deep trough forecast by the models keeps the moisture associated with the Alex disturbance to the south of the US/Mexico border, although the ECMWF is much more agressive in the forecast of its northward extent. Thus, we should monitor the progress of Alex, since it has some slight potential to influence the evolution of weather over the Southwest during the Fourth of July weekend. First - the synoptic situation has changed rapidly with a bulding high at 500 mb over the Great Basin pushing the portion of the Pacific trough that was over Arizona to the southwest. Winds at 500 mb this morning are from the south and there appears to be a weak cutoff low at 500 mb over northern Baja. To the east over the Southern Plains and new Mexico, there is another weak backdoor front acting to push low-level moisture (for example, El Paso has a much more moist sounding this morning than does Tucson) toward southeastern Arizona. The Tucson sounding is shown in the top image - it shows a very deep elevated mixed layer (in temperature) which is yesterday's residual boundary layer. 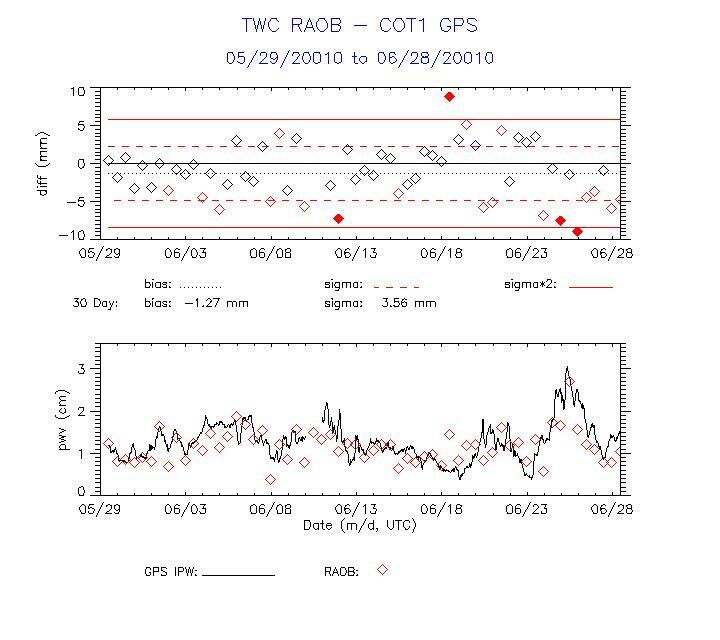 The Tucson Td data are too dry (see middle graphic comparing TWC PW with GPS PW) by about 5 mm or so, likely due to a bad Td profile in the old boundary layer. Thus, we are now in the time of year when the bad PW data from the RRS sondes will impact forecasts of convection. Second - It appears that deeper and stronger convection will remain mostly to the east today but that a nice influx of low-level moisture may come in by tomorrow morning with the help of outflows and the backdoor front. 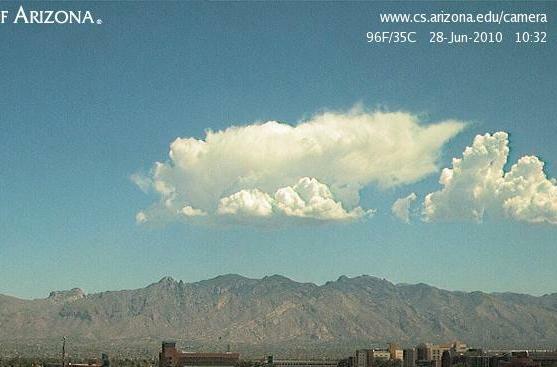 The bottom image shows that moderate cumulus have already developed over the Catalinas. The cloud structure appears to fit nicely with the sounding data above 600 mb - looks like bases are around 550 mb and the anvil (if one coould call it that) is only at 450 mb or so. Regardless, it's a good thermodynamic environment to support dry microbursts, if moderate convection, with snow or graupel virga, move out over lower elevations. John Diebolt wrote: The NWS in MSP has put together a page on this storm, which includes a large (14MB) radar loop from 6:15PM CT to 10:50 PM CDT. You can access it through their home page.http://www.crh.noaa.gov/mpx/Click on "Saturday Brings More Severe Weather and Heavy Rain to the Area"I hope my flight back to St. Louis on the 9th is a little less..eventful. Glad you made it there safely! NOTE - Corrected on Tuesday, June 29th. Had a hell of a time getting to MN last night. Got put in a approach stack over SW MN as a supercell was moving SW of MSP at around 0Z putting all air traffic in a snarl. Sat in the stack for about 45 minutes then vectored across southern MN then due north into MSP. Starting hitting moderate chop about 30 mi out and the capt. came on telling the flight attendants to buckle up and don't get up-had a worried tone to his voice. Got within 5 mi or so of KMSP and we about flew into a second supercell. I observed power line flashing on the ground along with a big inflow cloud base with freq lightning and was shitting as he kept the approach on until about 2 mi from the edge. We were in strong updrafts with continuous moderate to occasional severe turbulence as he finally veered off as the airport was now reporting G60. Go look at the 0Z radar-65-70dbz core. We then diverted to Sioux Falls, refueled, and returned a couple of hours later. I was unable to get pictures during the peak as it was too bumpy to take pictures or video but have a nice video as we returned to MN as the storms had now formed a squall line that was pushing into IA. This was one time that being both a pilot and meteorologist worked against me as 'ignorance was bliss' on this flight-or less scared. Before we left Tucson, I had the wife make sandwiches as I said we may be going to FSD instead of MSP-One time I wish a prediction didn't verifty! Several readers have left comments of various types since Art Douglas' summer outlook was posted. I am reposting the comments here - in reverse time order - to consolidate them and make more visible. 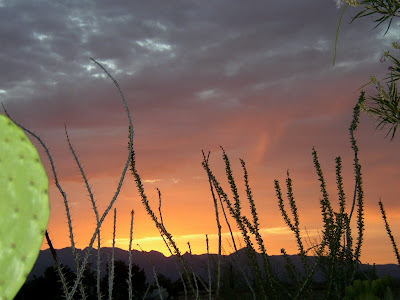 John Diebolt has left a new comment on your post "Art Douglas Shares His Summer Outlook": I looked at the NWS Site for monsoon data for Tucson and the analog years mentioned on the map (2005, 2001, 1998 and 1980). The Monsoon rain totals for those years in Tucson were 5.30" in 2005, a grim 2.42" in 2001, a slightly above average 6.86" in 1998 and slightly above average 6.89" in 1980. (6.06" is listed as average). The above average designations can of course be a misnomer due to the nature of the summer thunderstorm seasons. One storm can dump several inches of rain on one or two spots and when one of those is the official reporting station the total is not representative of the area. Perusing this data, since 2000, there have only been 3 years with an official total above the 6.06" average (2003-6.70"), (2006-10.20"), (2007-6.57"). Using the NWS Standard set of 1971-2000 there have been only 17 seasons with above average rainfall. 7 of those 30 years had rainfall less than half of the average. Since we all know Monsoon refers to a seasonal change in atmospheric circulation and precipitation patterns, at what point would the summertime pattern change we undergo become so weak, erratic and ill defined to no longer qualify..at least in this part of North America? I for one, hold out hope, with all due respect to Art, that 2010 does not turn out to be another bust. With the spectre of a La Nina and its attendant dearth of winter rainfall looming ahead, we could be looking at a perfect storm of sorts in terms of drought at least. It could be very grim indeed if we have to wait until Monsoon Season 2011 for our next opportunity to get substantial and widespread rains. (you might have guessed that). the monsoon arriving before Jul 10th...way too much westerlies. have to be forecasting this line up. I also note that the ECMWF forecast from last evening (0000 UTC 21 Jun 2010) is forecasting that a tropical storm or hurricane will be moving into the Gulf of Mexico at 168 hours. If this threat were to actually materialize it would trigger a media hurricane, in addition to the storm's impact on the industrial disaster situation in the Gulf. It's a very warm and actually a bit muggy morning in Tucson. The current Td is up to 56F and precipitable water is around 3 cm. There is a deep southeasterly flow present this morning with the next Pacific trough still affecting only the far western part of Arizona; however, yesterday's WRF forecast for today indicated that the trough would advance this afternoon, pushing the moist air back toward New Mexico. But for now, the dewpoint has been rising steadily since about 5 pm yesterday, when storms to the east, along with a weak, backdoor front from southern Plains, pushed the moist air westward. Phoenix has also experienced rising dewpoints and is at 55F. The visible satellite image above shows that that the debris clouds from last evening's storms have pushed considerably further west and north than they did yesterday. The sounding above indicates that there may still be afternoon CAPE at some lower elevations in southeastern Arizona, bringing the possiblity of sprinkles and microbursts. Thunderstorms are more likely on the mountains, but there will interesting things to watch today, as the dry Pacific air does battle with the moist intrusion. Unfortunately, the Tucson NWS radar remains out of service at this time; perhaps it will come on-line before the end of the day? CELIA IS A VERY IMPRESSIVE HURRICANE THIS MORNING...WITH AWELL-DEFINED 15-20 N MI WIDE EYE EMBEDDED IN A CLOSED EYEWALL WITHCONVECTIVE CLOUD TOPS OF -75C TO -80C. THE CLOUD TOPS HAVE WARMEDSLIGHTLY DURING THE PAST FEW HOURS...AND THE SATELLITE INTENSITYESTIMATES FROM SAB AND TAFB REMAIN 140 KT. THAT WILL BE THEINITIAL INTENSITY FOR THIS ADVISORY. THE CIRRUS OUTFLOW IS GOOD INALL DIRECTIONS EXCEPT THE SOUTH. Interesting large supercell in North Dakota moving right down an old mesoscale outflow boundary. The velocity (top) and reflectivity (bottom) images from the Minot AFB WSR-88D radar clearly show that the outflow boundary (which extends east all the way into a convective area in northern Minnesota) is feeding directly into the updraft region of the supercell. Middle cloud debris from yesterday evening's storms, to the east and southeast, have moved across most of southeast Arizona this morning - a nice change, after yesterday's blistering 109F. Dewpoints here in Tucson remain very low, but 50s have made it into the area closer to New Mexico border. Nice indicators that the thunderstorm season will be here before too long! Edited to add photo I took at sunrise this morning (June 24, 2010). 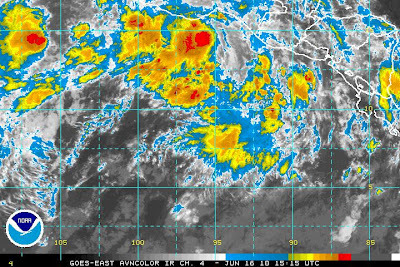 Tropical depression number 5 developed in the Eastern Pacific during the day yesterday, and it was officially identified by NHC last night. It has now been upgraded to Tropical Storm Darby (top visible satellite image). Bottom image shows Hurricane Celia this morning. I don't have the statistics at hand, but I know that it is quite unusual to get to the "D" storm so early in June. Bizarre - What's Going On Here? Very strange reflectivity image from Hastings, Nebraska, this evening. Does anyone know what's going on?? Radar images showing a strong supercell east-northeast of Cheyenne, Wyoming, at 2256 UTC this afternoon (22 June 2010). Storm had several reports of tornadoes with it, even though it was out in very desolate country. Plume of upper-level moisture (see WV image top) extends from what was once TS Blas northward into US. The 500 mb anticyclone over Texas and Oklahoma continues to battle with troughs from the Pacific. Looks like the troughs will mostly prevail the next few days so that moisture will remain, in lower-levels, to the south and east of here. But anvil debris and middle-level moisture will likely increase, as per this morning, before the next trough pushes in on Friday. Hurricane celia continues on a west to west-northwest path and is forecast by NHC to intensify to a moderate hurricane (winds great than 110 mph) during the next couple of days. 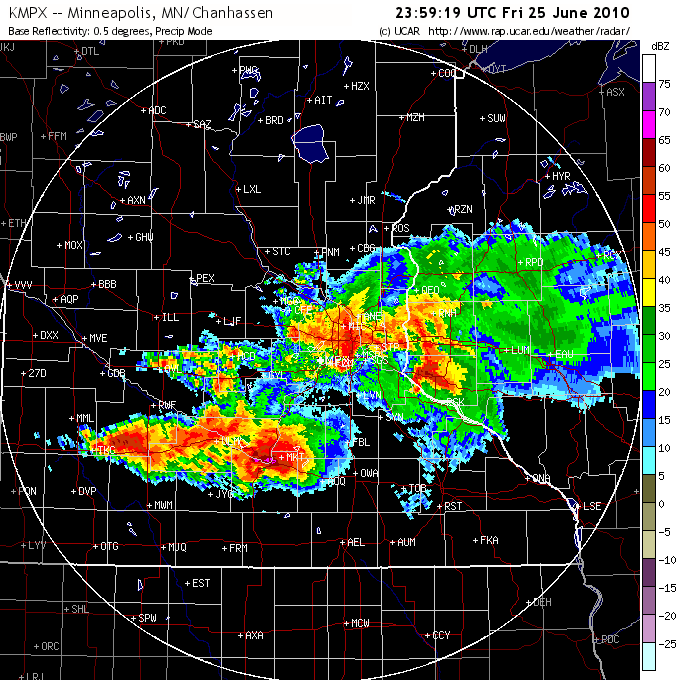 http://www.rap.ucar.edu/weather/radar/ are very interesting and reveal numerous boundary interactions, storm-storm interactions, and a number of supercell mergers. Obviously quite a wild evening out there! 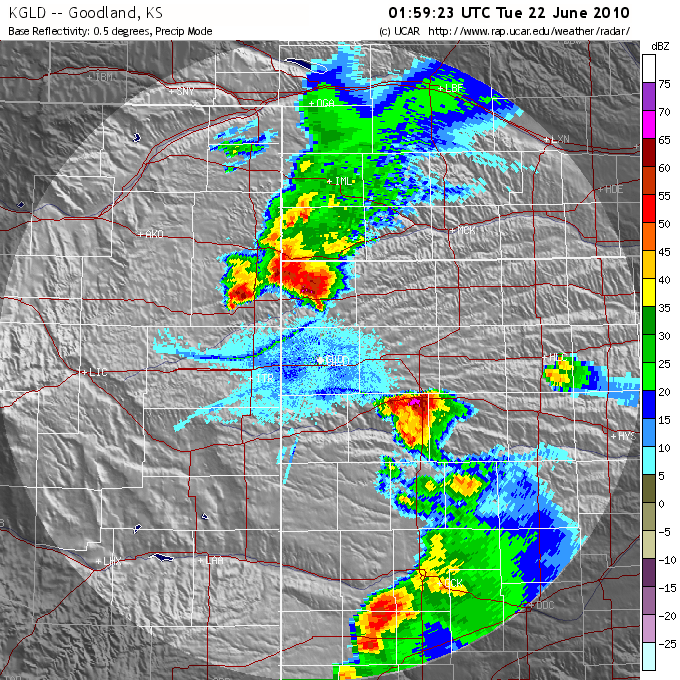 Velocity and reflectivity for 0.5 degrees at 0126UTC 22 June 2010 shown above for a really spectacular supercell thunderstorm northwest of Goodland, Kansas. Chuck Doswell reports from the High Plains: Chased this storm today. 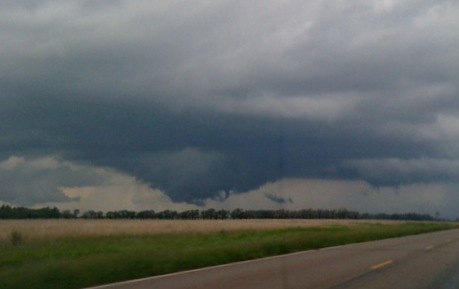 I believe we saw a large, rain-wrapped tornado near Idalia, CO. It was an awesome storm. 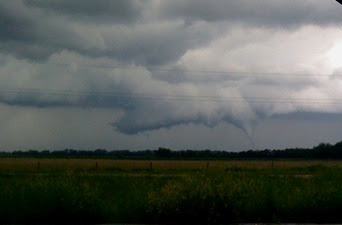 Check out my storm chase summaries when the 2010 summary is posted sometime in July. 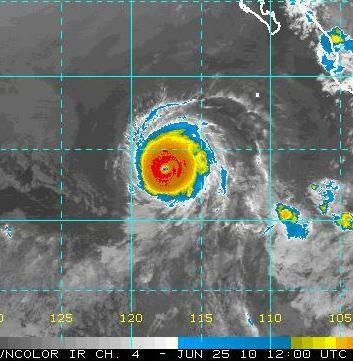 The National Hurricane Center updgraded Celia to a hurricane last evening, making her the first hurricane of the 2010 Atlantic/Eastern Pacific season. 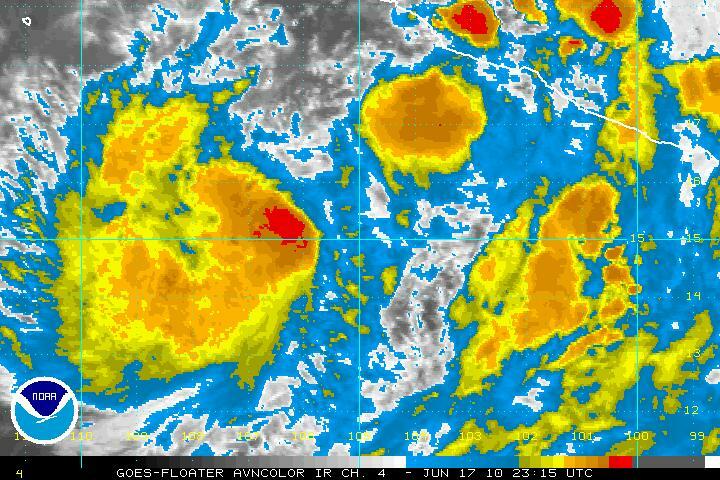 Celia is the western convective system in the above IR satellite image. She is forecast to move generally westward and to intensify gradually. North Kansas is experiencing its second round of severe thunderstorms today. This morning's bow-echo moved across Kansas City and weakened and dissipated as it approached St. Louis. Thus, it was not nearly as impressive as the severe system of Friday, which apparently moved all the way into Canada, after crossing the Detroit area. The current storms are very intense; the Topeka sounding is very unstable; but conditions in southern Missouri have been modified by a secondary convective event during the day. Thus, it is unclear at this time whether the current event will be long-lived, or focussed in northeast Kansas and northwest Missouri. I'm sure the folks in north Kansas are very storm weary. 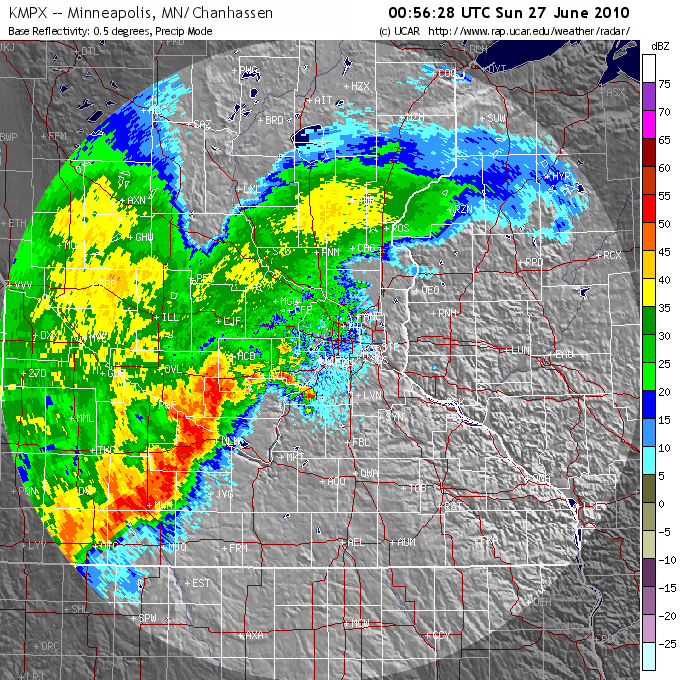 Yesterday morning at this time a bow-echo was in western Iowa, having moved across the Omaha area shortly after daybreak. That bow-echo produced severe winds and damage all the way east across the Chicago area late in the day. This morning another short line of severe thunderstorms is occurring; this time moving across northern Kansas. The 1407 UTC radar images from the NWS radar at topeka, Kansas, are shown above (0.5 degree reflectivity top and 0.5 degree velocity bottom). The line of storms exhibits a very strong shear zone and probably has a deep, nearly vertical, layer of intense convergence. It's not clear how long this event will persist, but the Kansas City area lies in its threat zone, and perhaps even St. Louis late in the day. Yesterday's event produced general chaos in the Chicago area and resulted in long airport delays. So, another day on tap with interesting summer-time severe storms. 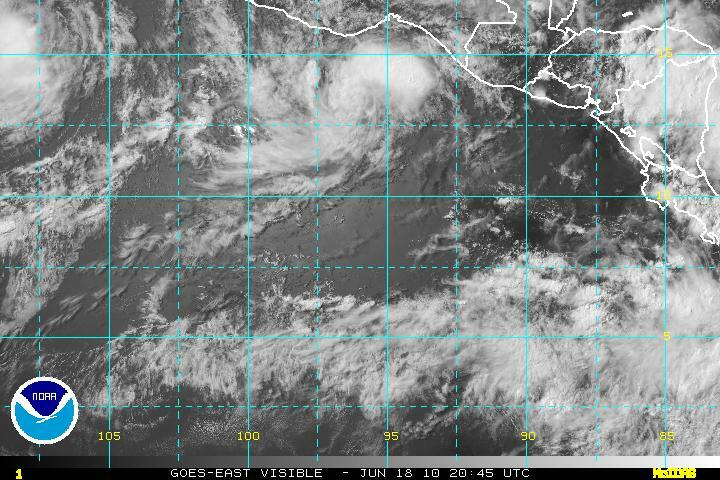 The unusual active period of tropical developments continues off the south coast of Mexico (see Art Douglas' comments in an earlier post). 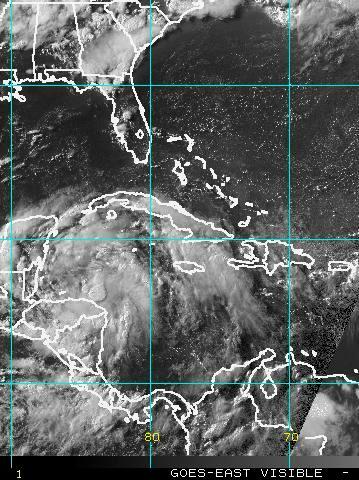 A new depression or storm has been spinning away in the visible satellite loops this afternoon about 12 degrees or so to the east of TS Blas. The morning sounding today (Friday, June 18,2010) at Tucson exhibits a Td trace that has very little structure through the entire sounding. This kind of simple shape of the moisture profile usually indicates an RH sensor that is not responding to atmospheric conditions. Indeed, a look at the raw data indicates that the RH is stuck at 20% (plus or minus a few percent) for the entire flight. 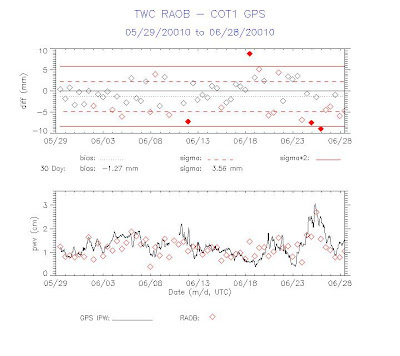 A nasty thing about this kind of bad data is that the PW can be either too great or too low relative to GPS values. In today's case the sounding was a bit too dry wrt the GPS measurement. There was a significant tornado outbreak in the north-central U.S. yesterday (Thursday, 17 June 2010), with more than 50 tornado reports noted on the SPC web page. The event was associated with a deep, synoptic low-pressure area at the surface that was over North Dakota and southern Canada at mid-day yesterday. This system was a nice example of a Hage Low (named after the well-known Canadian meteorologist, Kenneth D. Hage, who studied such systems) that produces an "instant occlusion" over the northern Plains, usually in Canada. The photos of the wall cloud, and eventual tornado, shown above were taken just west of Grand Forks, North Dakota, by Melissa Becker, a student at UND. The cross equatorial flow index (see top image) for the past 90 days (SLP Easter Island minus Puerto Libertad northwest Costa Rica) shows the nice pressure gradient spike that helped form Agatha with strong cross equatorial flow pushing the ITCZ north and enhancing surface cyclonic curvature on the ITCZ. 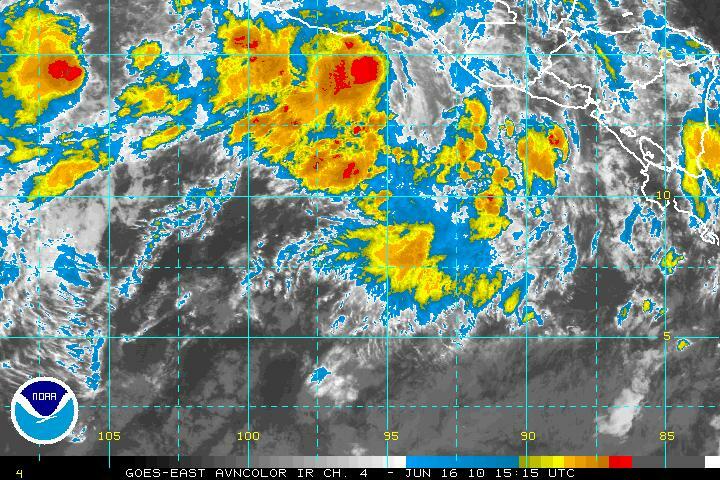 We are in another peak right now as seen in the Index and the ITCZ again has been pushed far north per the satellite imagery..........and low and behold, the NHC has just issued an advisory on the system near the Oaxaca coast. 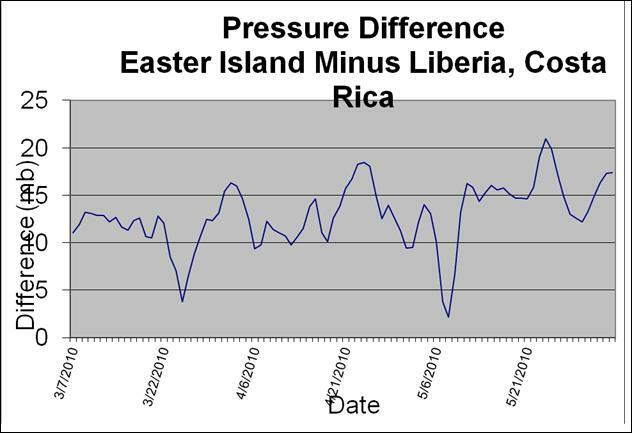 Looks like another peak in SLP in the South Pacific about the 19th-20th and again the 26th. I also see that the ECMWF brings the first summer precip to Arizona on the 23rd of June. It has been so extremely dry since mid-March that wildlife from the Catalinas are moving down into parts of the city of Tucson in search of easy prey and water. This morning when I was returning from my walk, I observed a large bobcat prowling through the front yards on our circle. He/she wasn't the slightest bit concerned that I was standing only 30 feet or so away watching. There was a report a couple of days agao of a black bear over in the east part of town. Photo above is of a large Soaptree Yucca by our garage - it's been planted there 12 years and this is the first summer that it has bloomed! 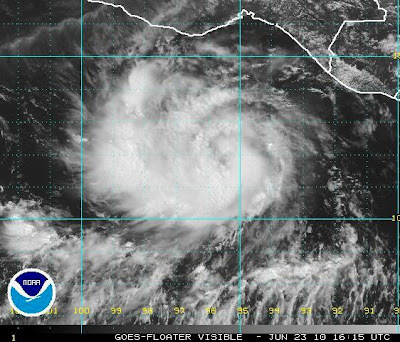 Tropical Depression Two-E has developed along the southern coast of Mexico. 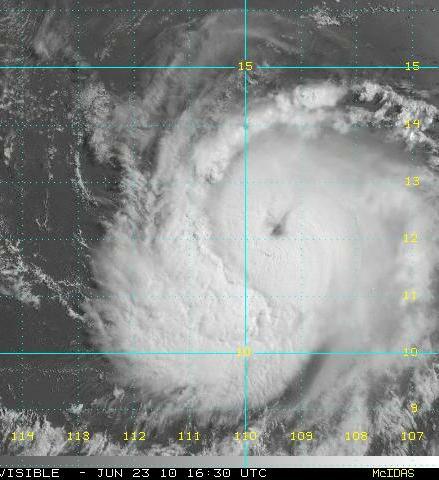 The NHC forecasts it to become a Tropical Storm and to move slowly westward. 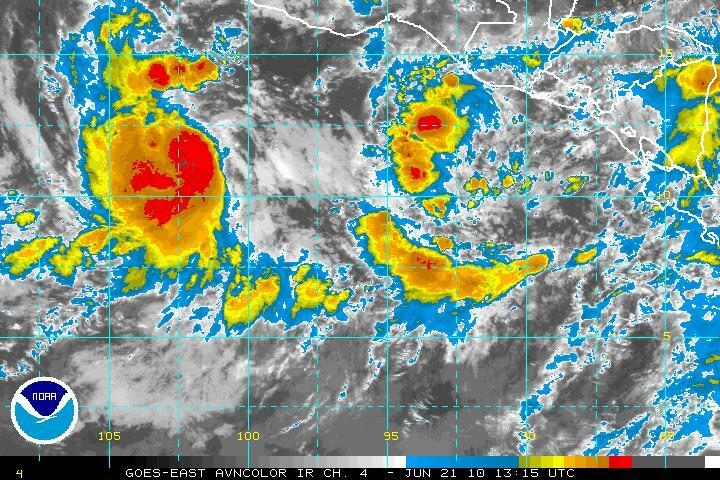 THE GOVERNMENT OF MEXICO HAS ISSUED A TROPICAL STORM WARNING FOR THE SOUTHERN COAST OF MEXICO FROM SALINA CRUZ WESTWARD TO LAGUNAS DECHACAHUA AND A TROPICAL STORM WATCH FROM WEST OF LAGUNAS DECHACAHUA WESTWARD TO PUNTA MALDONADO. The above shows a really ugly RRS sounding from Western Region. Sounding is from Salem, Oregon, at 0000 UTC 16 June 2010. What can I say? So it goes. The action had shifted slowly southward to the Midland area by yesterday afternoon. The Midland WSR-88D image shows the outflow-enhanced cool front intersecting the dryline just to the northwest of the radar. Very nice radar depictions of the nearby boundaries on both days. I noted severe reports from VORTEX 2 crews, so hopefully some rich research data were captured.